Listen, We’re Family is a work of Jewish verbatim theatre, so bang up to date that when a character talks about keeping kosher even the recent horse-meat scandal gets a mention. Four actors play out the real-life spoken words of a range of interviewees across an age spectrum that stretches from young adults through to a nonagenarian East End barber. It’s an intimately/incestuously constructed piece with Shale, who co-wrote, acting the elder male parts, whilst co-writer Lloyd also directs and though the dialog is a selection of brilliantly captured vignettes, the show is more like leafing through a live action scrapbook, rather than following a drama with an engaging plot and protagonists that we might possibly care about. To emphasise the fact that the actors are mouthing the actual words of real people, the performers all wear headphones throughout. This is a gimmick that only serves to create a virtual “fifth wall”, distancing the actors from audience. 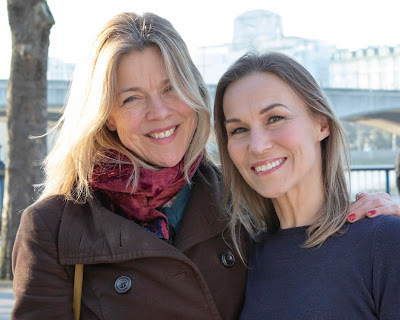 Verbatim is fine, Alecky Blythe has proved that at the National Theatre with her stunning London Road, it only requires good actors to learn a script. This show’s headphones distract and insult the audience. The performances though are all good with some that are outstanding. Maggie Steed’s elder woman ranges from a maternal homemaker lighting Sabbath candles in her 60s through to an 80 year old widow, distraught that her separation from her husband led him to commit suicide. The insights that Steed brings are brutally stark and her performance is at times deeply moving. Shale’s characters are predominantly middle age men, all with surprising stories, though his 91 year old barber is possibly the best portrayal of an old Jew since Eddie Murphy donned the white slap to play Saul in Coming To America. There is bittersweet irony and comedy aplenty throughout the script and Shale segues seamlessly between his roles. He will make for an interesting Willy Loman one day. Isy Suttie is an engaging performer in the first act, covering the women under 50, with a particularly fascinating turn as an Austrian Holocaust émigré who fled to Canada before coming to London. Suttie brings the complex nuances of this survivor into a fascinating relief. As a younger whining wife however, too many of her other roles, particularly after the interval become indistinguishable and there is a sense of lazy writing here, with a failure to bring out the full potential of this talented young actress. Tom Berish as the younger man presents some of the least conventional characters. His gay guy is a refreshingly honest portrayal of a sexuality that is still viewed with prejudice by some within the Jewish community and his performance gives a pleasing challenge to too many age-old stereotypes. In London Road Blythe crafted a clever musical via the verbatim genre, working around the most difficult of topics. By comparison, Shale and Lloyd’s work drifts. They present little more than a well-acted documentary, holding up images that whilst being comfortingly recognisable or even perhaps challenging to many in the audience, still offer little more than a series of familiar landscapes. (Though one of Shale's non-observant characters' references to the comforting familiarity of the cadences of Kaddish, the universal Jewish mourner’s prayer, is an inspired inclusion.) The recurring themes of dysfunctionality that the characters display suggests a skewed and sensationalised set of stories that are at odds with reality. Many Jewish families are flawed for sure, (so whose isn’t?) but there is more good out there than this play would suggest. Nonetheless, credit to JW3. It’s a bold, bravely commissioned work that is finely performed. One looks forward to more provocative theatre from this exciting and beautiful new venue.